It's Not Rocket Science: Garden update too! I am terrible at pacing myself, so if anyone is actually reading this then you get two posts in one day! This is about our garden plot. We cut down all those trees earlier this year (read: had professionals cut them down for us). Then we had the stumps ground out on a Thursday (I forget which Thursday, but it was in February). Then Chris borrowed a roto-tiller from his boss and we cleared a 20' by 15' section of ground to the right of our deck (looking out from the house). It's behind the garage, and receives TONS of sun now that the pesky diseased tree that was there is gone. It's sort of flat; close enough at least. Anyway over that weekend we hacked out all the remaining tree roots with the cutter-maddock and the axe (that was super annoying; there were tons of surface root clumps). We tilled the plot, and then tamped it down. 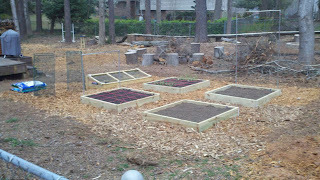 We laid down 300 square feet of landscaping fabric, and using 8 treated 2"x8"x8's we made 4 raised beds, each 4' square. Then we filled the beds with a mix of topsoil ($14 for a half ton, I think? 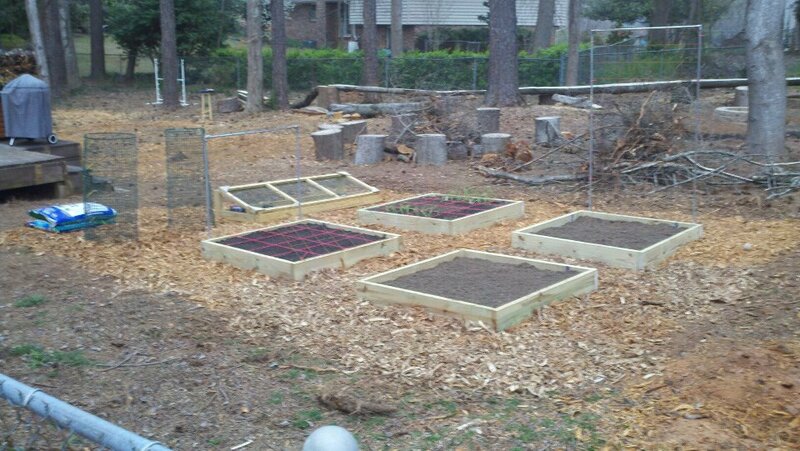 ), Miracle Gro garden soil, mushroom compost, and cow manure compost. I have had a garden plan laid out for ages, and I finally got to start planting things according to the frost date guidelines. We used the mulch from the ground up stumps to cover the paths, and we will probably add a low fence at some point. I have to check with Chris, who has waged a war against the squirrels, but more on that later. Here's how it looks from the front yard looking over the chain link fence. 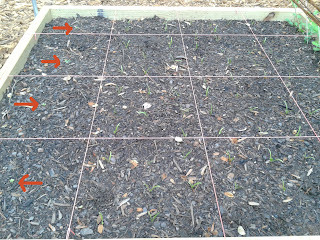 Not many plants yet; just a few onions. The structures are all in, though. I made trellises out of EMT (metal tubing usually used for electrical work) and remesh (big sheets of wire grid that are used to reinforce concrete). 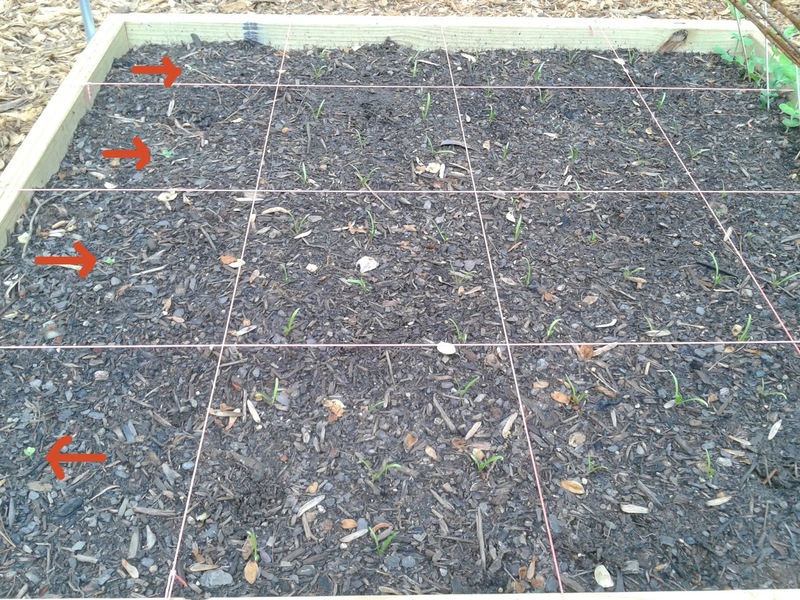 The pea trellis (left) is at an angle; the peas will grow to shade the spinach and kale. 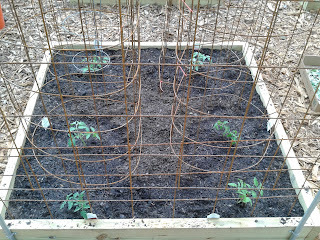 The potato towers (far left) are still empty; the cherry tomato trellis (right) is set up but there are no tomatoes yet. Here is an excerpt of my plan. 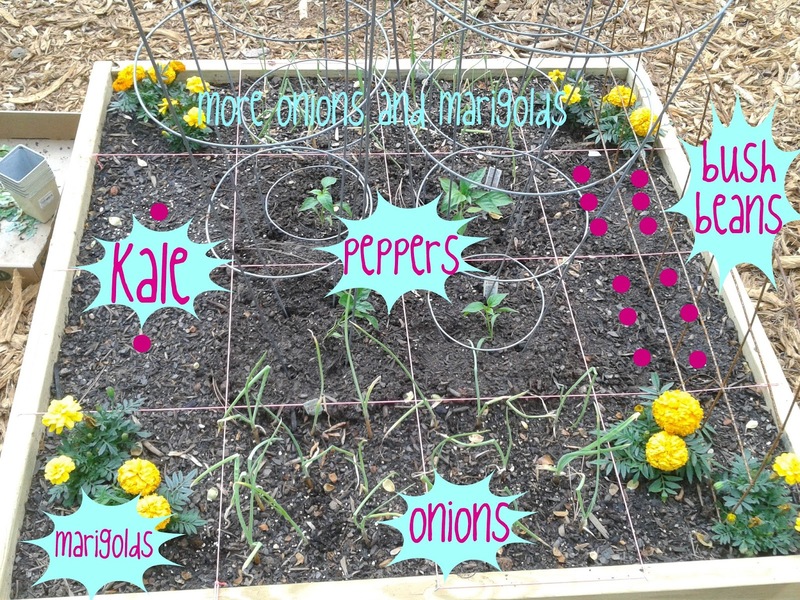 This is always subject to change, and will evolve as we harvest spring and summer vegetables and replant with fall veggies. Anyway, the near bed holds squash and zucchini. 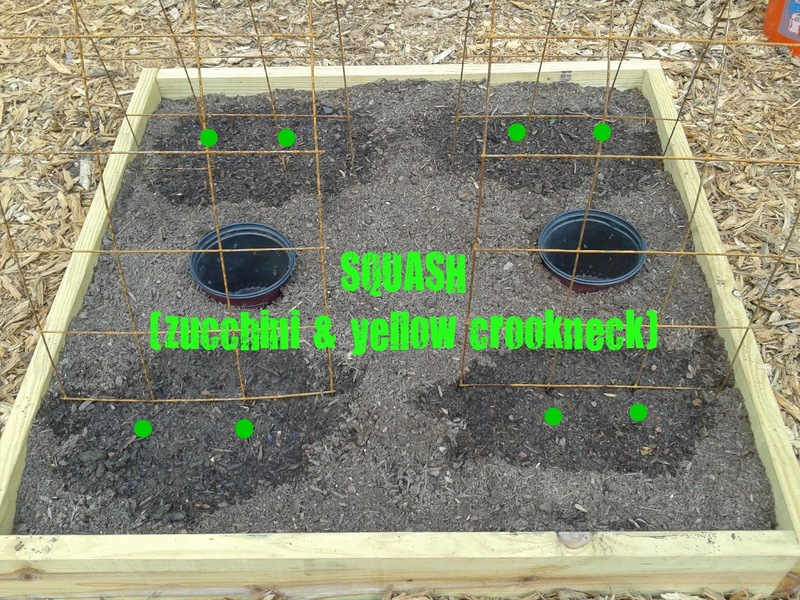 I still don't have plant markers finished (I'm spraypainting paint stir sticks yellow on one side and chalkboard painting the other side to write in varieties) so I forget which are yellow crooknecks and which are zucchini. Oops. I guess we'll find out in a few months! Chris bought too many pepper plants so he tried to salvage them with the white buckets. The orange bucket holds carrots (which grow too deep for our shallow raised beds). You can see the peas starting to climb the trellis on the left. 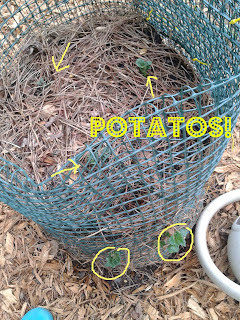 The potato towers are growing well (they've gone nuts in the past two weeks, too, it's awesome!). The tomato cages are assembled to the right; I got organic tomatoes (some heirlooms) from Pike Nurseries, so I have 6 different types of tomatoes growing. I can't wait to try them all! I have 4 in cages and the 2 cherry varieties will go up the trellis. I planted shortest in front, tallest in back (or shortest to the west, tallest to the east). They will all get tons of sun, regardless. We volunteered at a Crop Mob (weekend gatherings of volunteers to help a local gardener or farmer with specific tasks in the fields) and I got some cuttings of a lemon balm plant. It has since died and I shelled out $3 at Home Depot to get a replacement. 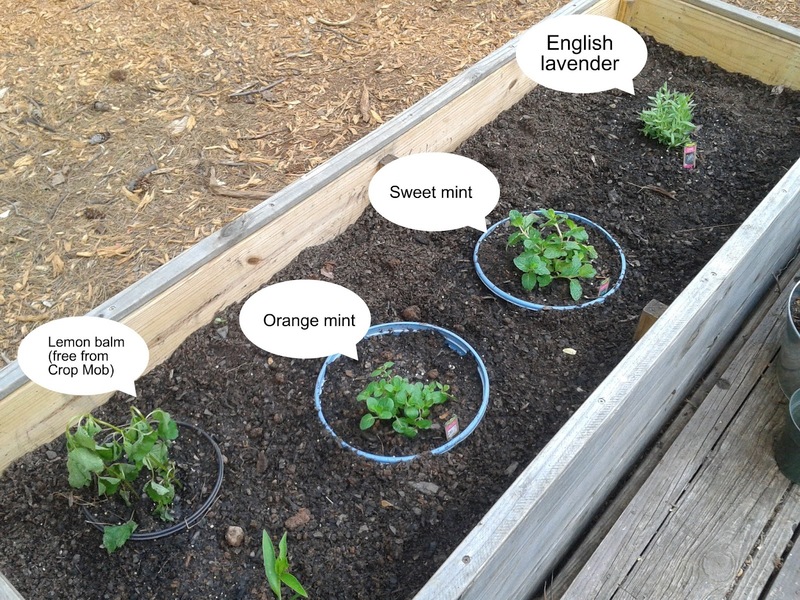 I planted it in a bucket to try to control it, as well as the two mint varieties. They are known for taking over gardens. I also tried to grow lavender from seed (hah, how ambitious) but that failed too. The mint and lavender I got at half off, though, so $1.50 each. Not bad. I can't wait to make homemade popsicles with fresh sweet mint! I made an oops, and La Roma II is actually a determinate variety, meaning it bushes; the others are indeterminate, which is what most people grow in cages. We'll see how it grows, though. This garden is one big fun experiment to me! I planted two squash in each quarter, but will thin one so I have a total of 4 plants. 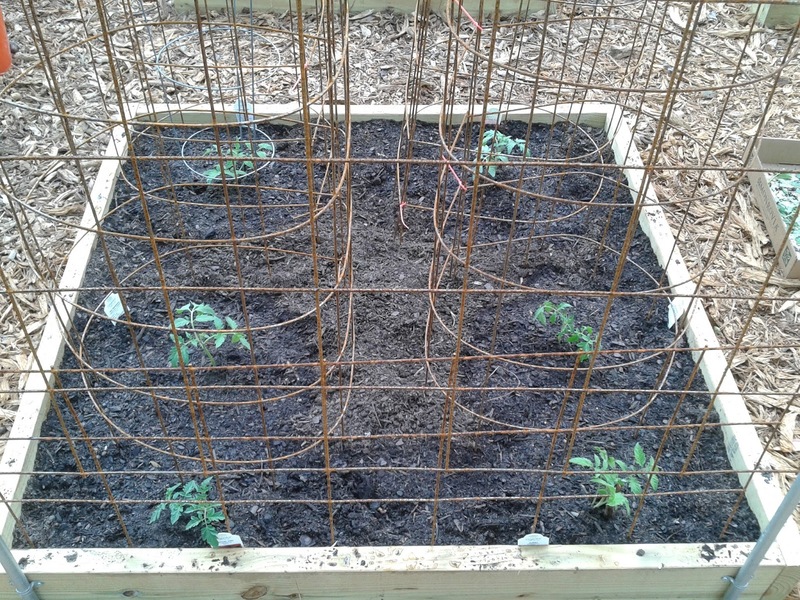 That's still kind of crowded, but I used scraps from the tomato cages to make a trellis, and we'll see if I can train them to grow over that. The buckets are for watering. Fill the bucket, let the water soak into the soil through drilled holes. That's how one magazine said to do it so I'm giving it a shot. The squash have sprouted, so I'll probably thin them this next week. Survival of the fittest! I totally had fun with google+'s photo editor while making these pics. 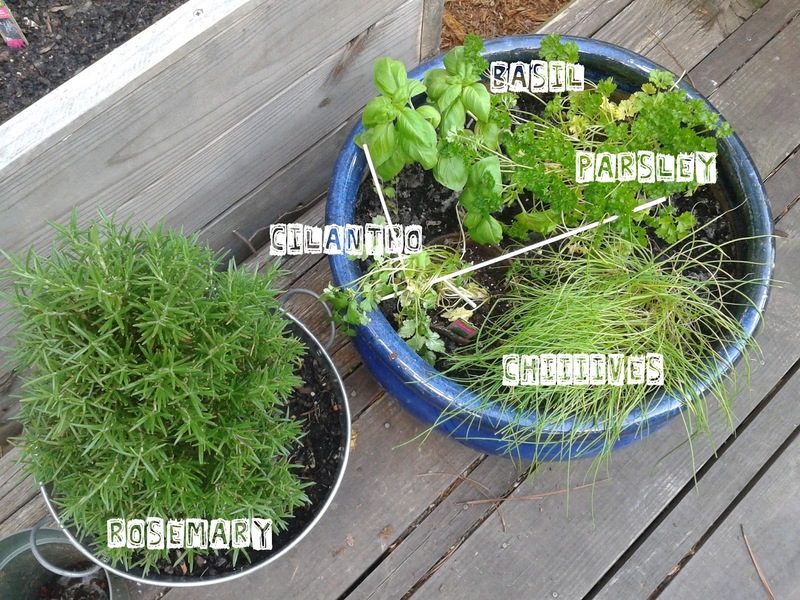 The herbs are pretty self-explanatory; the cilantro has died and I probably won't try to grow it again. Everything else is happy, though! The potatoes have gone nuts since this photo was taken. The little sprouts out the side have grown out and up and leafed out a lot. The 3 planted in the top have exploded. 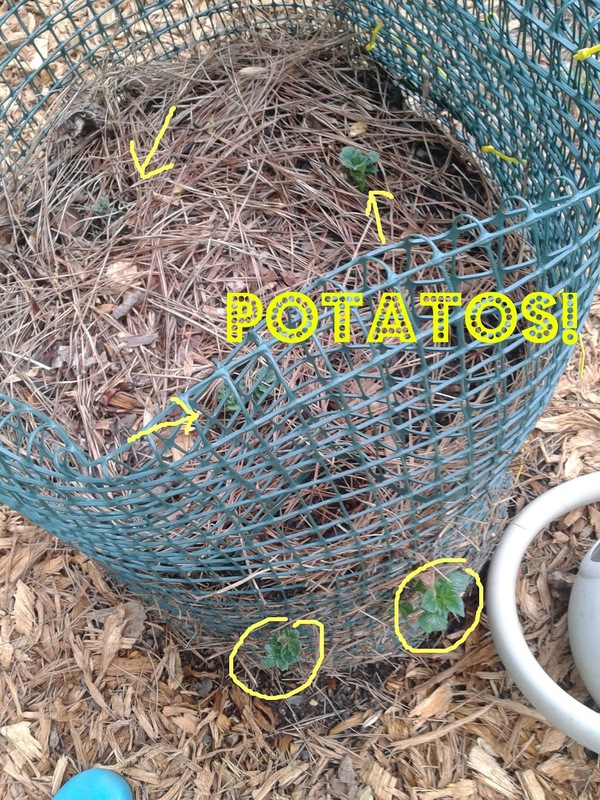 They seem to be pretty happy potatoes. I'll just water them and leave them alone until harvest in the fall. Also yes, I misspelled potatoes. Oops. 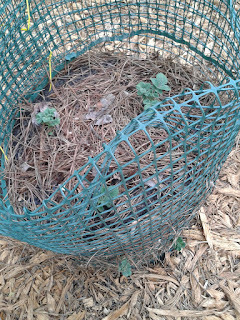 This is the kale/spinach/peas bed. The kale have red arrows pointing to them. Only one is really doing well; the rest are still tiny. Hm. I should water more? The spinach are growing but are still skinny. The squirrels have gotten some of them. We replant, though, and we'll just have staggered harvest that way. 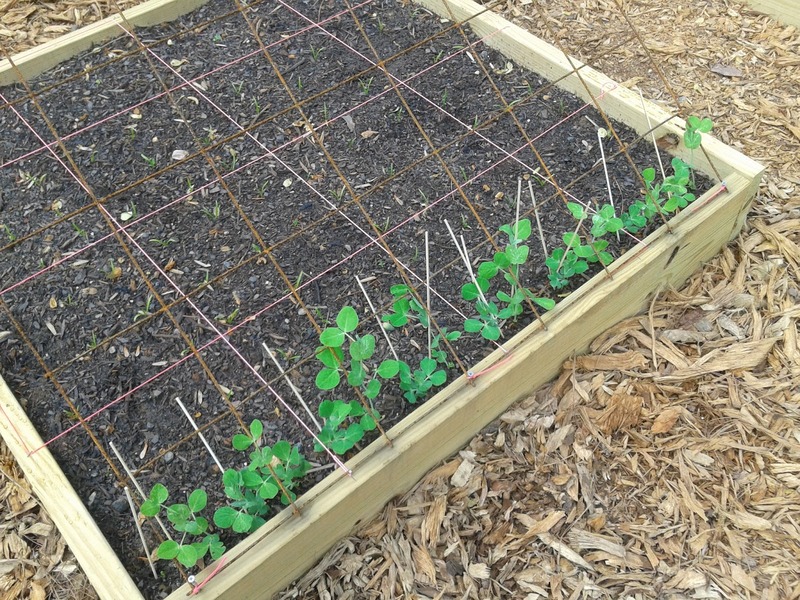 The peas are growing, and I help them along by weaving them through the remesh when their little tendrils have trouble finding the trellis. Here is the final bed; it's pretty well labeled. I have since planted smaller marigolds in the other beds as well. 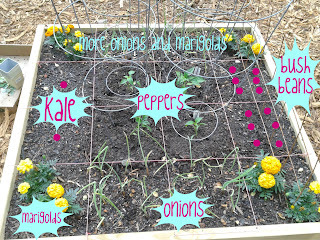 They are supposed to smell funky and keep bugs and other pests away from my precious vegetables. The beans have popped out of the soil now so we can expect beans in a month or so! They grow so quickly! The squirrels got one of the bell peppers, and last night when I came home from gymnastics I saw some chicken-wire contraption in the garage. I'll have to see what Chris is up to when I get home from work today. 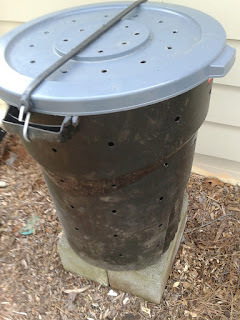 Oooh and we made a super-cheap compost tumbler! This is your standard 32-gallon Rubbermaid trash can. It is $9.88 at our local Home Depot. We used the flat lid from our shop trash can, and bought a bungee for less than $2. I drilled 1/2" holes around the trash can, sides, top, and bottom. I put two cinder blocks together for a base to allow air circulation, and now we fill it with vegetable scraps, rinsed egg shells, and coffee grounds. When we want to tumble it, we roll it along on the ground. It is sooooo much cheaper and easier than trying to find a big 55-gallon food-safe barrel and modifying it! Seriously, 15 minute project, tops. 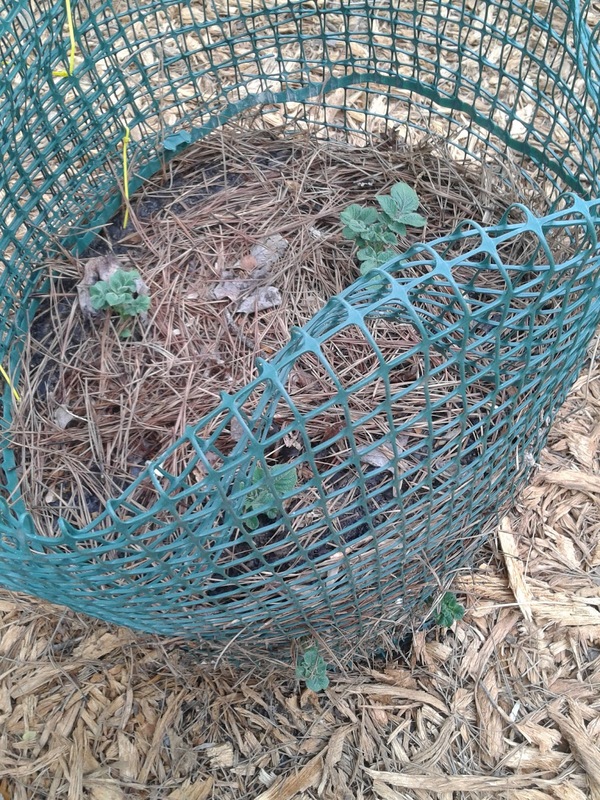 If you are in the market for a composter, don't bother with the fancy, expensive thingies. 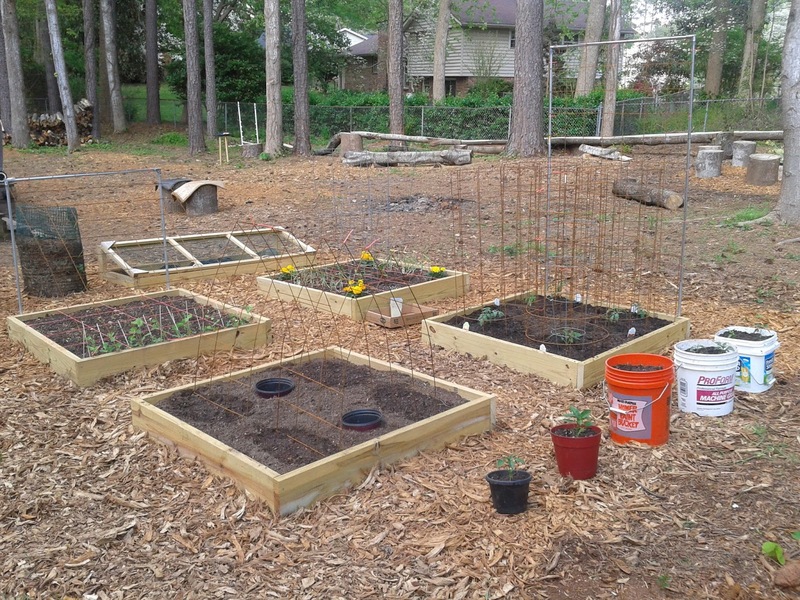 If you've got a wooden frame made out of pallets, awesome; if you want to keep your compost safe from scavengers, though, this is a great solution. And that is our garden so far! There was a little monetary investment, on the order of $150 or so, but I hope the returns are worth it. I would love to finally successfully grow zucchini and tomatoes and peppers and everything. I hope our new, sunny garden will bathe our little veggie babies in light and warmth and they will grow big and strong so we can eat them! Nom nom nom.